Have you ever gone to someone's incredibly decorated Halloween haunted house or to one of the haunted house events in your town? There's always that one person who jumps and screams at those terrifying witches that pop up or that just start cackling evilly. I, admittedly, am that person. These life size witch props are very scary. I always get embarrassed, because I know what's coming and I scream anyway! 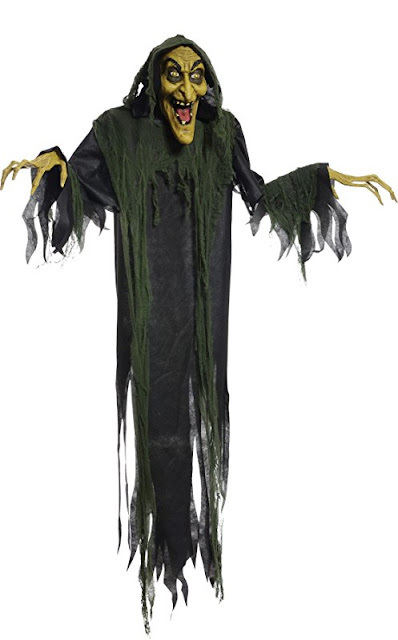 Take a look at what I think the 6 creepiest life size witch props for Halloween haunted houses are for 2016. 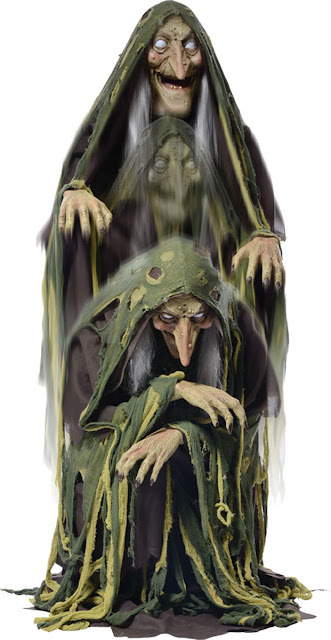 I think that Hagatha the Towering Witch looks like the Evil Queen (in witch form) from Snow White. The way she looks like she's about to leap and attack you is so unsettling. If that's what actually happens, people will run away in fear! Hagatha the Towering Witch is also on eBay! Don't you think that the hanging dark witch looks too happy with herself? This is the most malevolent grin of all, because she is obviously enveloped in madness. 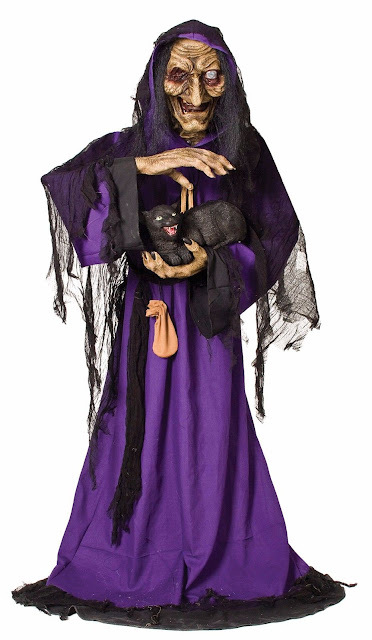 When I saw the hanging dark witch on eBay I felt less scared, because she only talks and doesn't physically move! Is it just me, or are the witches getting creepier down the list? The hanging white witch has a serious and psychotic expression on her face. It looks like she is starving for flesh and blood! I am grateful that the hanging white witch doesn't move or say anything. You could place a really bright light with a sensor behind her. 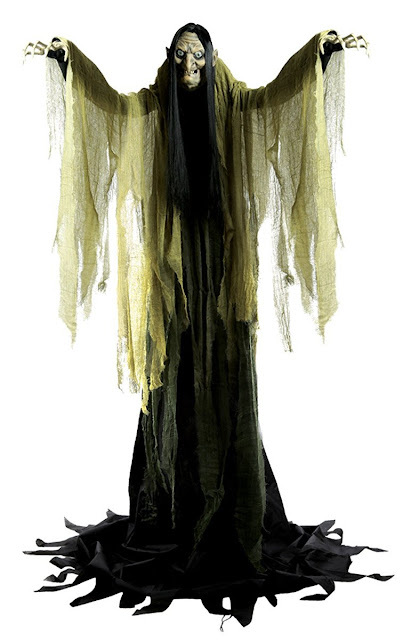 So when someone approaches your house the light will flash and voila - horrifying hanging witch! Apparently haggard witches don't frighten people anymore. Now we need eyeless and demonic looking witches such as the Matilda Witch. Her name is so cute, so why can't she be cute? To make matters worse, she's holding a feral cat that looks like it wouldn't mind poking your eyes out too! Matilda the Witch is animated, so beware! This vile crone is casting a wicked spell. Look at the spell speaking witch beckoning to you with her eyes bulging out! It's as though you've fallen into her trap and she's ready to put you in her stew. 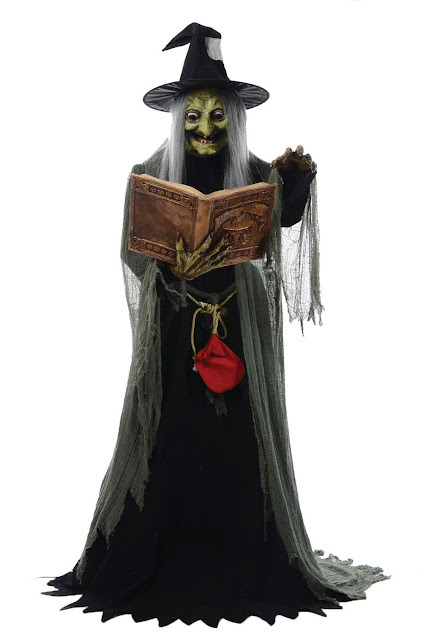 This spell speaking witch is animated and stands 6 feet tall! If you don't find this horrifying, I don't know what is! There will be nothing but blood curdling screams coming from your lawn if you place the Swamp Hag in the bushes. She starts hunched over until someone triggers the sensor, then suddenly she pops up and says "Come on over here a l'il closa...D'ere ain't nuttin' ta be 'fraid of!...D'is slimy, wretched place is my charmin' home." The Swamp Hag is also available on eBay! 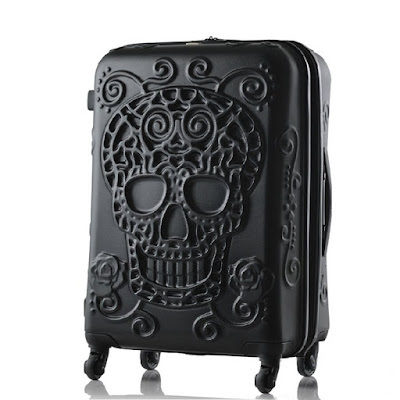 These are quite scary, right? 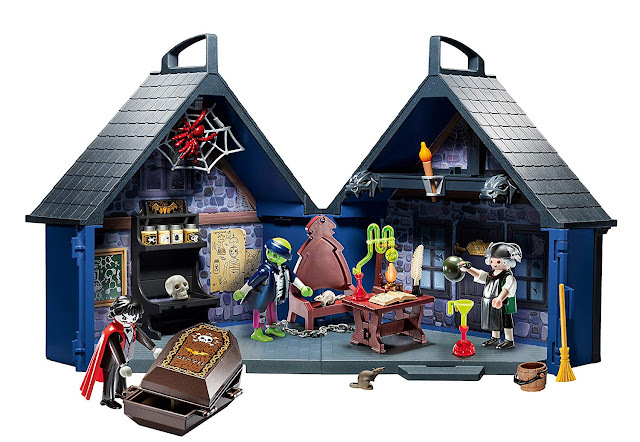 Would any of these witches fit into your decor theme this year for Halloween? Make sure to let us know which one is your favorite. Favorite is an odd term for this particular circumstance! Comment below!